One of my favorite childhood summer activities was the Northern Maine Fair. More than just rides and games, our local country fair had a farm animal petting zoo, tasty treats, a demolition derby, and an expo hall showcasing agriculture, arts and crafts, floral arrangements and more. We’re a little bit over the cold weather here at our house. It’s definitely had us missing Florida and the “brisk” 40s-50s we usually experienced in the winter down there. I’ve been daydreaming about us just tossing our things in a suitcase and taking off on a road trip in search of the sun and possibly a little sand. Honestly, though, if we were going to take a road trip right now, it would probably be north. I know, right into more cold, what’s up with that? But it’s actually been warmer in Northern Maine than it has been here some days, and at least they have the right type and amount of snow to both play in and ski on. When we road trip, we like to rent a vehicle to drive. It’s nice not to add the wear and tear to our own car, and we get pick out an SUV that has plenty of space for toting around all the supplies needed for a family that includes a toddler. And renting with Enterprise allows us to Plus our Points through the Enterprise Plus program. Learn more about it on the Enterprise Plus Your Points promotion website. Last week we traveled to Maine to surprise my Grandmother for her 85th birthday. We surprised more than her – only my parents and brothers knew we were coming. It was a lot of fun to contact different family members and friends and say “oh, hi! We’re here!”. We were only gone for a short time so we left the laptop at home. I had scheduled a few posts for you all while I was gone, but apparently the scheduler also decided to go on vacation. You’ll see those posts come through over the next few days. 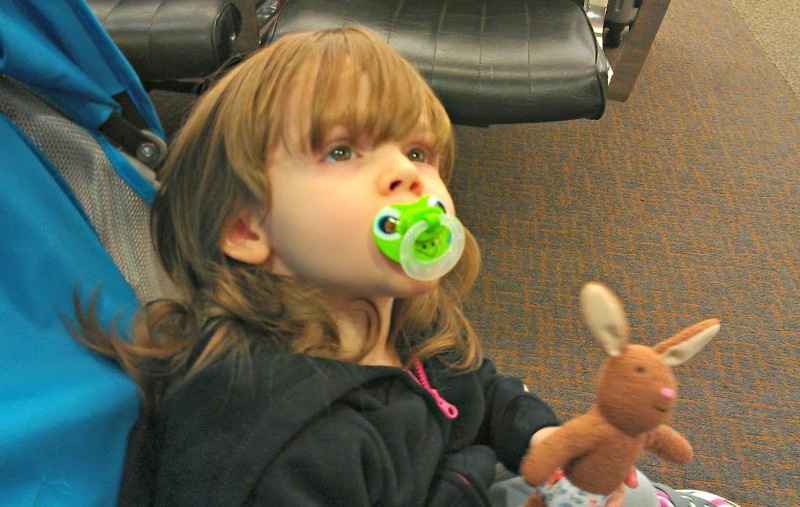 Waiting to get on the airplane with her buddy Bunny-Bunny.